The skyline of Tokyo makes an ever fascinating subject for photos. 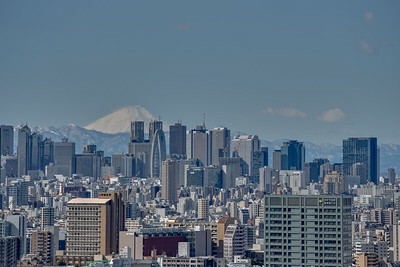 Majestic mount Fuji, the relief peaks of the Japanese Alps, clouds, sun, moon and stars compete with the cityscape of skyscrapers, parks and a sea of buildings. Every season has its owns shades of lights and colours. In winter the view is very clear where. Spring greats with the light colours of the blossoming trees. In summer the sky is most often hazy in the heat and humidity and one looks desperately for a blotch of blue sky. An exception is the immaculate blue sky after the passing of a typhoon. Autumn brings an array of saturated green, red and yellow leaves. The sunsets are most spectacular from my high rise appeasement that faces west. In Winter the sun drops far left of the skyline of Shinjuku while in Summer it sets far right over the Sunshine 60 tower of Ikebukuro. Many a morning when I look through the windows I can't resist to press the shutter. In the evening too when the sun sets against an ever changing backdrop of clouds there is an irresistible drive to click again and again. Long time no see Fuji san! During the summer months the air over Tokyo is very hot and humid and as a result mostly misty. All the more apprciated are the exceptional clear nights. 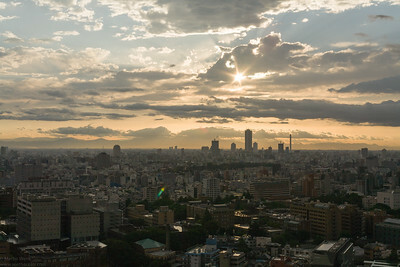 One of thoes days when the sky over Tokyo produces a great scenery; view towards Ikebukuro. Snow in Tokyo! We get some days with snow almost every winter but it rarely stays long. AS this winter was cold it remaind for a few days. After the typhoon had passed the sky cleared up and the day finished in a wonderful sunset. This photo was stitched from 6 handheld portrait format shots at f=40. Fuji san over Shinjuku HDR from 3 takes at -2/0/+2 EV, 200mm. May 20th 2006,18:00. The sun is standing high over Shinjuku. December 18th, 2006, 16:30. The sun is already setting at this time in the west over the Docomo tower. February 11th, 2007. A beautiful sunset over the city with the evening star on the sky. April 28th, 2008. A clearing over Ikebukuro in the otherwise black sky. April 28th, 2007. 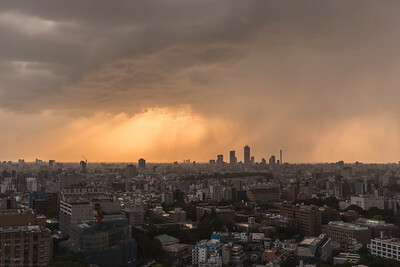 Rain and gusts of wind batter the skyline of Ikebukuro. May 12th, 2007. 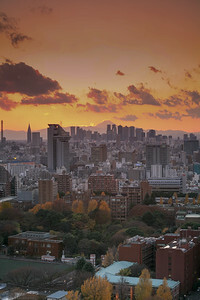 A classic sunset over Ikebukuro. May 27th, 2007, 17:50. Majestic clouds forming over Tokyo, dwarfing even skyscrapers. May 27th, 2007, 17:55. The sun rays passing through a hole in the clouds. June 15th, 2007 08:40. The classic postcard view of Tokyo. Mount Fuji is still covered in snow from half way up. August 12th, 2007, 19:15. 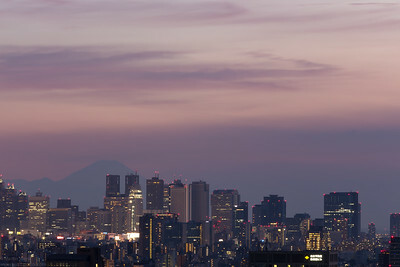 End of the sunset with mount Fuji rising in the background beyond Shinjuku. September 15th, 2007, 18:30. The crescent of the moon against the sunset of west Tokyo. 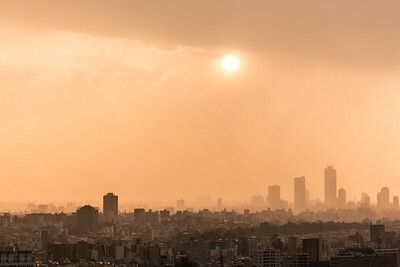 March 5th, 2011 a hazy morning over Tokyo. Some sun rays found their way on the slope of Fuji san on this otherwise pale scenery. November 18th, 2007, 17:00. Spectacular light over the mount Fuji during this early winter sunset. February 4th, 2008 7:15 AM. The low morning sun casts a long shadow of the building. 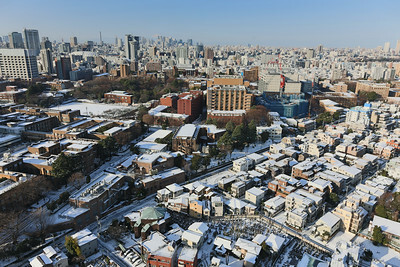 Rare snow is on buildings and the soccer field of the Tokyo University. February 25th, 2008, 08:30. Mount Fuji all in white reaching into the clear blue winter sky over Tokyo. December 6th, 2008, 16:45. Winter sunset with a beautiful orange sky. Note the yellow leaves of the Ginkgo trees around Sanshiro ike still hanging on in December. December 6th, 2008, 17:15. The orange light is still lingering on the horizon but the city lights have all come on meanwhile.